Who's Your Daddy Inc. is a licensing and branding company with trade names on over 300 products. 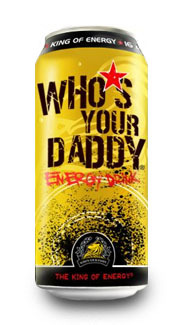 They currently distribute the Who's Your Daddy King of Energy energy drink nationwide. The original formulation (as well as the sugar-free version) has a Cranberry-Pineapple flavor, and the latest addition to the WYD energy drink lineup is a Green Tea variation. Who's Your Daddy currently sponsor Greg Sacks in the NASCAR NEXTEL Cup Series, and have previously sponsored Glynn Motorsports in the Busch Series. The WYD website offers downloadable MySpace graphics, wallpapers and alcoholic drink mixer recipes. Producer: Who's Your Daddy, Inc.